2. Renaming a song title now updates the underlying filename for the song, and consequently updates what is displayed in the song list. 2. Miscellaneous updates to the Help system. If you are unsure which version of PowerWorship you currently have installed, you can follow the instructions here: viewtopic.php?f=7&t=485 to verify whether you already have the latest version. 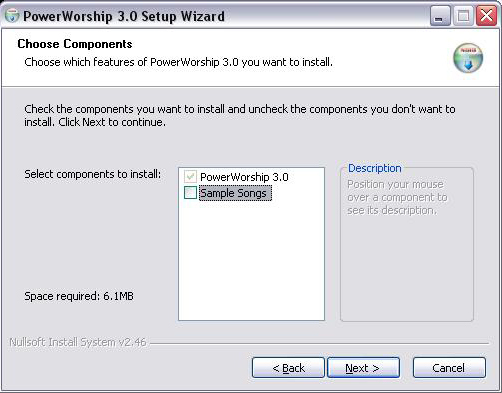 Follow the instructions below (choose Option 1 or Option 2) to upgrade your existing installation to PowerWorship 3.0.0.83. 1. Backup your songs and groups by following the instructions here: viewtopic.php?f=6&t=6 OR by making a backup copy of the Songs/ and Groups/ directories (e.g. C:\Program Files\PowerWorship 3.0\Songs, C:\Program Files\PowerWorship 3.0\Groups) using Windows Explorer. 2. Make a backup copy of your templates (C:\Program Files\PowerWorship 3.0\Templates) if you added additional templates after installing PowerWorship. 3. Uninstall PowerWorship 3.0 (e.g. via Add/Remove Programs in Windows). This will cause all of your songs and groups to be deleted if they are stored under the program installation directory (e.g. C:\Program Files\PowerWorship 3.0) as they are by default. It will also cause all of the currently installed templates to be removed. If your songs and groups are stored outside of the program installation directory (and you updated the program settings to point at the external location) then the uninstall will not cause your songs and groups to be removed, however the templates will be removed in all cases. 5. Restore your songs, groups, and templates, as needed. The songs and groups can be restored using File > Import ... if you chose to export them before uninstalling the program, but the templates will need to be restored manually (e.g. via Windows Explorer) if you (at some point) added additional templates that need to be restored. This option will overwrite the existing program files. Your existing songs and groups will not be removed, but now would be a good time to back them up. See #1 under Option 1 for backup instructions. On the Choose Components panel, deselect Sample Songs to avoid overwriting the sample songs -- in case they were installed previously and have since been modified. 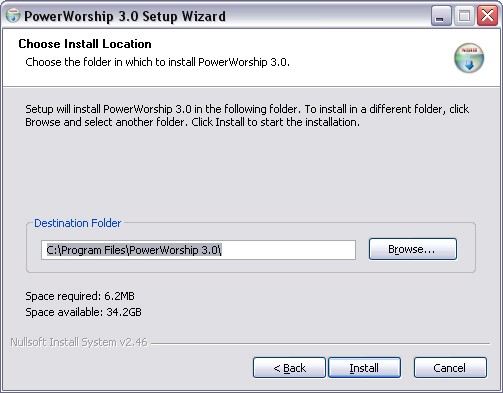 If you currently have PowerWorship 3.0 installed under the default location (C:\Program Files\PowerWorship 3.0) then accept the default install location to overwrite the existing program files. Otherwise, enter the current install location. Click Install to upgrade the selected install location.